Battery Park on the lower tip of Manhattan is one of the city's green highlights. A 32 acre fringe of greenery it is filled with skaters, strollers, and 20 installations of public art. The ornate railing outside the Winter Garden announces City of the World by Walt Whitman, for all races are here, all the lands of the earth make contributions here. The Rector Gate by R. M. Fischer is an ornate archway at the intersection of Rector Place and the Hudson River Esplanade. But there is one piece of public art that is far more. It reaches into visitors' soul and compels attention. 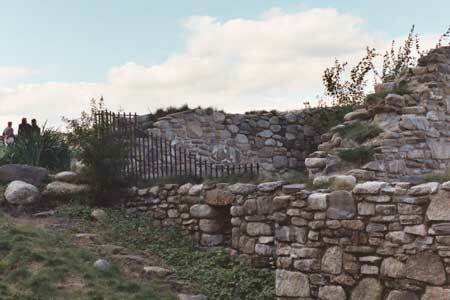 The Irish Hunger Memorial (2002) by Brian Tolle honors the memory and experiences of the 1.5 million people who perished in the famine of 1845-1852. The Irish potato famine began when a blight destroyed the crop, a staple of their diet. By 1847 millions were starving and dying. Between 1847 and 1852 hundreds of thousands of Irish immigrated to New York. There is some controversy about the Famine however. It has been alleged that the potatoes were still shipped abroad to willing markets, leaving almost none for the poor population of the country, or pricing it out of their reach. At the very least there was culpable mismanagement. It's composed of the reconstructed ruins of an actual cottage from the era. Paths leading up through a landscape meant to evoke the fields. The entrance tunnel is inscribed with snippets from letters and public documents. A narrator and cast tell the story of people's lives. Explore slowly.